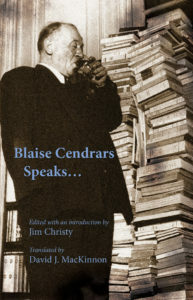 Poet, novelist, filmmaker, world traveler, raconteur, rounder and roust about, Blaise Cendrars blazed an arc across the star-lit skies of modernity. Originally published by Denoel in 1952, Cendrars Speaks… is a collection of radio interviews and memories of his life and times. From surrealism, to cubism, to the French novel, Cendrars was enormously influential. Cendrars encounters and friendships are legendary. What a writer learns from Cendrars is to follow his nose, to obey life’s commands, to worship no other god but life. The only true things that prevent you from cursing and reviling life are saints, children, flowers and birds, lunatics, the gratuitous gifts that come to you from God knows where, harvest workers and innocent souls. Without these life would be impossible. Frédéric-Louis Sauser (September 1, 1887 – January 21, 1961), better known as Blaise Cendrars, was a Swiss-born novelist and poet who became a naturalized French citizen in 1916. He was a writer of enormous influence in the European modernist movement. As one of the twentieth century’s most original writers, the poet vagabond Blaise Cendrars could conjure up words that confounded even his legendary cronies Apollinaire, Picasso, Braque, Chagall, the Delaunays, Reverdy and Modigliani. Cendrars was a beat poet fifty years ahead of Allen Ginsberg and Kerouac, a clown juggler who worked the circuses with Chaplin, a film-maker with Abel Gance, a collaborator with the Delaunays and Fernand Léger, a soldier with Curzio Malaparte, and a man who understood that media was about to converge in novel and revolutionary ways. He titled a series of his poems KODAK to codify his conception of each stanza as a snapshot of his travels worldwide. He once wrote a poem on 2 metre pages, placed each page end-to-end, in the identical height of the Eiffel Tower. His references were arcane or revolutionary – Mayakovsky, the Russian revolutionary artist who filled Red Square with his neon newspaper, an unknown aviator who carved out the words “Citroën” in smoke across the sky, and dotted the trema over the e while flying upside down, the levitating saints St Joseph of Cupertino and St Teresa of Avila. Cendrars’ testamentary wish was to have his ashes scattered over the Sargasso Sea. As a man, he was callous enough to refuse to lodge his own children, even during the worst phases of the Second World War, yet he could express heartfelt sympathy for the anonymous time-servers trudging out of the metro after a day of drudgery. He once punched out the pacifist Rilke with an upper cut from his remaining arm during a heated discussion on the war in the Closerie des Lilas. He was a jack of all trades, and mastered many of them, from soldier to watchmaker to beekeeper, assuming in turn the postures of Montmartre bohemian wild man cohorting with Modigliani, multi-media genius, deadbeat dad, fearless patriot, Brazilian buccaneer, polemist and unrivalled raconteur. He set his pen to every conceivable form of writing from epic poems to war reporting, ghost writing, ad copyist, and movie scriptwriter. In the end, as any “Cendrarsian” will tell you, you don’t read Cendrars for character development or plot lines. It is because you, and others who have preceded you, have fallen under his spell. Cendrars had an intense passion for modernity, but his enduring love was for the Middle Ages, that he liked to describe as “enormous and delicate”, citing Verlaine. One suspects the influence of Albert Durer, and particularly his frame to visually divide a subject into grids, and the occasional physiological cruelty he displays is surely derived from his own hero and spiritual mentor, Rémy de Gourmont. In his poetry, you catch the ordinary mysticism of Hokusai’s 36 views of Mount Fuji in woodblock print, the humorous philosophy and indifference of Chuang-Tzu and in his novels the absurd madness of Céline and Lewis Carroll. His descriptions of war evoke a Heironymus Bosch tryptich, as if he viewed his own experience through the retroscape of a man yet to be born. “There is no truth, only action” says Cendrars, and that dictum provides another key to both his speech and his writing – it hinges upon cadence and tempo as much as the selection of words. And, yet, amidst the frenetic pace of his adventure and war novels, the contemplative man occasionally makes an appearance. Very few writers have the ability or inclination to “paint” a canvas in their writing; even fewer to bring musicality to poetry and prose. Cendrars attempted both, because as a master raconteur, and a former circus performer, timing, tempo and presentation were everything. Michel Manoll, who interviews Cendrars in the following pages engages Cendrars immediately in a form of improvised creative sparring over the radio waves – prodding, provoking, cajoling, consoling, and his approach works. Cendrars could easily have clammed up like a shell, but instead he unleashes himself on the world, ad-libbing his way through the events, the inventions and the great characters of the twentieth century from Chaplin to Al Jennings, the great train robber, all of whom he knew, all of whom he instinctively understood because of his great sympathy for men who, like him, followed their own path. Because the medium of radio – one feared by his contemporaries – suits him so well Cendrars shines during the radio interviews in this volume. In a similar position, Breton insisted on writing down all his answers in advance. Cendrars on the other hand, insisted on improvising, and the interview becomes a jam session. 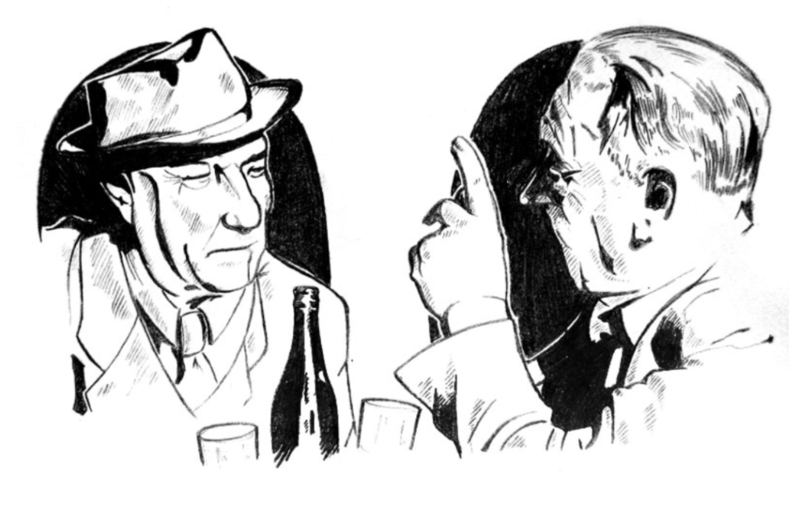 Any rendering of the text – particularly in translation – has to take into account the theatricality of Cendrars’ back-and-forth with the interviewer Manoll. He begins by talking of his father the inventor. Then he’s onto his days as a ghost writer for Apollinaire. Suddenly, he confesses “I was a writing addict! Don’t read, it’s dangerous!” Or he refers to his thirty-six professions. His days as a whaler. Trapping armadillos. Cendrars derided Picasso as the son of a curator. He hated Breton the surrealist as a liar and a hustler. Today, people increasingly resemble each other, not by virtue of their qualities, but by their lack of qualities. The individual is shunned, as if the reduced space on the planet has everybody thinking originality is a luxury for another time. Here is a man who stands apart, who fearlessly found his own path, and then, “held the posture” until the end of his time on the mortal coil. Step into these pages then, and listen to the words he spoke – to their originality, their musicality, their humour, their occasional savagery, and more than anything, the love that this extraordinary man had for humanity in all its irregular forms and contours. Every word contained in this book was first spoken into a microphone in 1953, and only later transcribed, giving it an audio flavour, even though it appears in print form.